(Updated 1/30/09) A far-reaching winter storm covering most Plains, midwestern and northeastern US states is the second deadliest winter storm this season for icy road fatalities, with 36 confirmed deaths recorded during the storm's 4-day transit across the country. Hardest hit during the storm were the states of Texas and Virginia, with 7 deaths each - with Texas' incidents all due to freezing rain. Missouri recorded 5 fatalities, with 4 in Arkansas, 3 in West Virginia and 2 each in Oklahoma and Kansas. Texas, Missouri, Virginia and Oklahoma now join the list of states with 15 or more icy road fatalities this season. 14 of Virginia's 15 fatalities occured in this month alone. This week's winter weather has spiked the season-long toll to 378. (Detailed stats here). Snow in the southern US states is a rare event, and when it happens, local drivers often are not prepared. The North Carolina State Police logged more than 2,500 accidents during Tuesday's snowfall across the central and eastern areas of the state. Despite the massive number of crashes, only one fatality was reported. In other news, various snowfalls on Monday the 19th created across the eastern and midwestern US by a large upper-level trough have caused the fourth deadliest icy road event in the US this season, with 11 people losing their lives. Four of those occured in Virginia, making the 19th that state's deadliest icy road day so far this winter. And an unexpected trend has begun in the states of Michigan and Minnesota, with alarming fatality rates in the past month. Both are northern states that have a generally winter-saavy population, and up to this point, have had relatively low accident rates compared to their Midwestern neighbors to the south (despite seeing more snow and ice events). Michigan has jumped to the #2 deadliest state in the US with 24 deaths, 11 of those occuring since the first of the year. (Detailed stats here). It's a number that back when I started this project, I never thought I'd see reached. It took only 3 months of this season to reach the 300 mark, with a steady average of 100 deaths per month. With nearly three months of winter weather left to go, that pace means we could be seeing 500 or 600 by the time the last snow and ice events wind down this spring. (Detailed stats here). Additional reports of fatalities from the January 5-6 freezing rain event across the Midwest have increased the death toll to 17, ranking the storm as the third deadliest event of this winter season. The following table shows the four worst winter storms in terms of icy road fatalities this season - all were freezing rain events. (Detailed stats here). 1. December 23-24, 2008 Freezing Rain 49 49 lives lost during the two-day storm across the Midwest, Mississippi Valley and Plains. 2. January 26-29, 2009 Freezing Rain/Snow/Sleet 36 36 lives lost in the major storm across the Midwest, southern Plains, and mid-Atlantic. 3. December 16, 2008 Freezing Rain 23 23 lives lost in one storm across the Midwest and southern Plains, mainly in Texas and Oklahoma. 4. January 5-6, 2009 Freezing Rain 17 17 lives lost in the Midwest in less than 24 hours, from Arkansas to Ohio and Michigan. 5. January 19, 2009 Snowstorms 11 11 lives lost across the eastern US and midwest, 4 in Virginia. 6. December 26, 2008 Freezing Rain 10 10 lives lost in one storm across the Midwest, 7 of those in the state of Indiana. 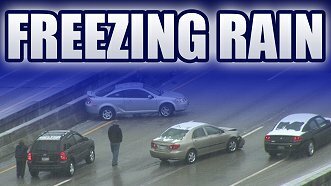 UPDATED: Another widespread freezing rain event across the Midwest claimed 15 lives in less than a 24-hour period from Monday evening (January 5) through Tuesday afternoon (January 6). Hardest hit were the states of Ohio and Arkansas, both with 4 deaths each. Several major cities experienced significant impacts from the storm, including St. Louis, Indianapolis, Cincinnati, Columbus and Pittsburgh. The national toll for icy road fatalities for the 2008-2009 winter season now stands at 273 as of January 6, 31 which have occured since the start of the new year (Detailed stats here). On Tuesday, December 23, 2008, freezing rain took the lives of 32 people in the midwest. It happened again on Friday, December 26, when 10 people died - 7 in Indiana alone. Hundreds if not thousands of accidents - too numerous to realistically count - resulted in countless more injuries and no doubt millions of dollars in damage. The tractor-trailer crashes alone easily resulted in millions of dollars lost in equipment and shipments combined. Entire cities and counties were shut down. People were stranded on highways in traffic jams for hours. Tornadoes are a fearsome and deadly phenomena. Decades of research, forecasting and warning priority have been given to the cause of protecting life and property from this danger. Television stations go wall-to-wall when a tornado warning is issued. Sirens sound. People stop what they are doing and take cover. And as a result, lives are saved every year. 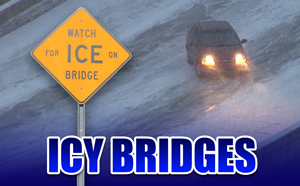 Freezing rain accidents are the most severe of all weather-related crashes because drivers can't see the hazard. And consequently, they are traveling faster, caught completely by surprise, and when their vehicles lose control, impacts are some of the most severe of all collisions. It doesn't take a well-warned ice storm - all it takes is a little freezing drizzle, a little rain shower that no one is watching. So my question is, why does a developing freezing rain scenario get little more than a last-minute advisory? I've watched time and time again this winter as National Weather Service advisories are quietly issued in the middle of the night, during rush hour, in mid-afternoon - with little fanfare. Rain moves in with temperatures below 32 degrees, and no one notices - no wall-to-wall TV coverage, no sirens, no warning tones, nothing. People then get in their cars and get on the interstates, oblivious to the fact that they are facing a danger that is more likely to kill them that day than a tornado, hurricane, lightning strike or flood (or any other weather phenomena) in their entire lifetime. So what can be done? Granted, it is well-known that even tornado warnings have a hard time getting to the people who need to hear them, as they often aren't prepared with the means to receive them. But at least the warnings are there. Freezing rain is a weather phenomena that definitely deserves much stronger wording and more aggressive public dissemination of the warnings than it's getting now. Expand and emphasize HPC freezing rain outlooks - NOAA's Hydrometeorological Prediction Center currently issues outlooks for freezing rain twice a day for the continental US (similar to the SPC convective outlooks - Day 1, Day 2, and Day 3). However, the outlooks only denote areas that are at risk from receiving a quarter of an inch or more of ice. The outlooks are more geared at alerting for ice storm potential, not icy roads. The criteria for an outlooked area needs to be expanded to include any area that is at risk for receiving light freezing rain - anything that could cause road hazards. More aggressive warning dissemination - No more "freezing rain advisories" - I think we need to see something akin to '(life-threatening) road ice warnings'. I think at the very least, tones should go out on commercial radio and TV airwaves. Anything to alert the public of the gravity of the situation. This hazard needs to be given the same treatment as a 'tornado emergency' - it's taking two to three times as more lives. More aggressive awareness campaigns - Awareness campaigns are already in effect for lightning, tornadoes, floods, severe weather and winter weather. I recommend that freezing rain and icy roads be given their own emphasis separate from the winter weather umbrella. I believe that the public needs to develop the same respect for icy roads as they do tornadoes and hurricanes, to the point of recognizing the warning signs and chainging their decision making process when icy roads threaten.